Farrar, Straus and Giroux, 9780374281328, 416pp. After her father has a heart attack and subsequent surgery, Helen Atherton returns to her hometown of Washington, D.C., to help take care of him and, perhaps more honestly, herself. She's been living in Los Angeles, trying to work in Hollywood, slowly spiraling into a depression fueled by hours spent watching C-SPAN-her obsession with politics a holdover from a childhood interrupted by her father's involvement in the Iran-Contra scandal. "I don't know whether to think of him as a coconspirator or a complicit bystander or just someone who was in the wrong place at the wrong time." Though the rest of the world has forgotten that scandal, the Atherton family never quite recovered. While living with her father in her childhood home, Helen tries to piece together the political moves that pulled her family apart. All the Houses is, at its heart, a father-daughter story. 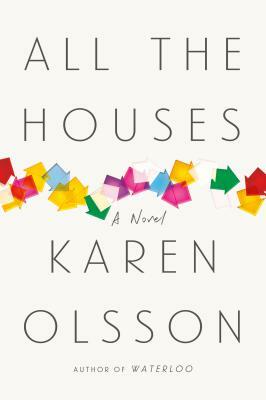 With razor-sharp prose, an alluring objectivity, and a dry sense of humor, Karen Olsson writes about the shape-shifting of our family relationships when outside forces work their way in-how Washington turns people into unnatural versions of themselves, how problematic and overbearing sisters can be, and how familial nostalgia that sets in during early adulthood can prove counterproductive to actually becoming an adult. Karen Olsson is a writer-at-large for Texas Monthly and a former editor of The Texas Observer. Her writing has appeared in The Washington Post, The Baffler, The Nation, and other publications, and has Awards from the Association of Alternative Newsweeklies for best investigative reporting and best news feature. She lives in Austin, Texas. Waterloo is her first novel.